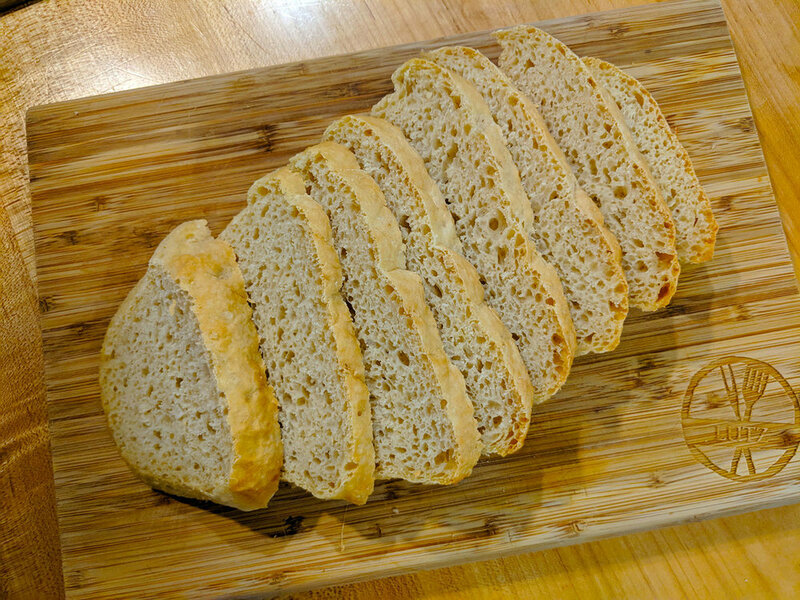 If you love bread as much as I do, then you’ll appreciate a recipe that doesn’t break your back but will impress all your guests. 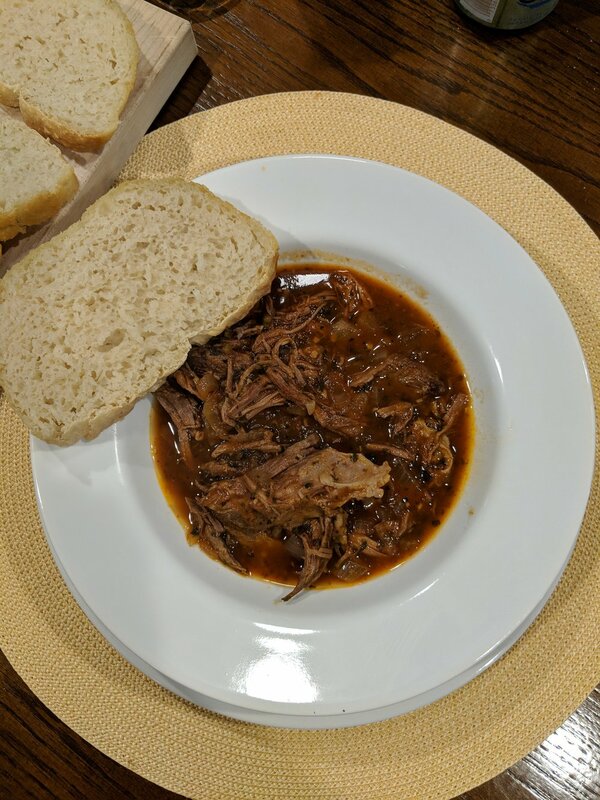 At this point I don’t even remember where I first found this recipe but I have never looked back. This has become my number one go-to bread recipe for just about anything. The above photo was taken a few days ago when my husband cooked up a venison stew for dinner (Thanks Sean, for the delish Venison steak!) and thankfully made some tasty peasant bread to sop it up. The beauty of this recipe is that it doesn’t require kneading. It’s sticky, a bit tricky to work with, but once you get the hang of it, those two pyrex bowls will be some of your favorite baking vessels. Believe me, you won’t be disappointed. I host Thanksgiving every year – usually somewhere between 12-20 people, and one year we made this bread and we have done it every year since… by demand. Below I pasted the recipe but I also put a link at the bottom. Keep this recipe close. You’ll use it over and over! The cheapest, most widely available 1-qt bowl is the Pyrex 322. 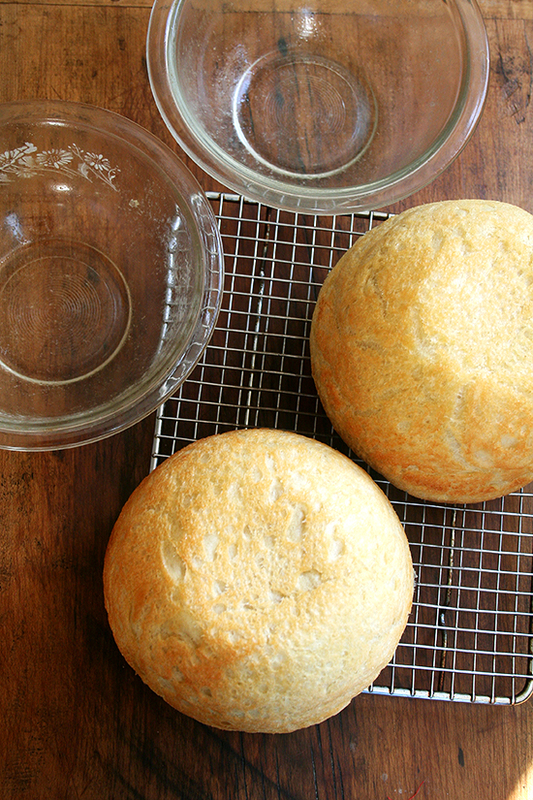 The vintage Pyrex #441 bowl is my favorite bowl to bake the peasant bread in — the perfectly round shape of the bowl creates a beautiful round loaf. It belongs to a set of four nesting bowls (also called Cinderella bowls, specifically the Pyrex #441, #442, #443, #444), which I have purchased from Ebay. I absolutely love the set in general, but I love most of all that I can bake the whole batch of peasant bread in the second largest bowl (#443) and half of the batch in the smallest bowl (#441). The set runs anywhere from $35 to $50 or higher depending on the pattern of the Pyrex. More pictures of the bowls can be found on this post. Preheat the oven to 425ºF. Grease two oven-safe bowls (such as the 1-qt pyrex bowls I mentioned above) with about a tablespoon of butter each. Using two forks, punch down your dough, scraping it from the sides of the bowl, which it will be clinging to. As you scrape it down try to turn the dough up onto itself if that makes sense. You want to loosen the dough entirely from the sides of the bowl, and you want to make sure you’ve punched it down. Then, take your two forks and divide the dough into two equal portions — eye the center of the mass of dough, and starting from the center and working out, pull the dough apart with the two forks. Then scoop up each half and place into your prepared bowls. This part can be a little messy — the dough is very wet and will slip all over the place. Using small forks or forks with short tines makes this easier — my small salad forks work best; my dinner forks make it harder. It’s best to scoop it up fast and plop it in the bowl in one fell swoop.